This contributed volume summarizes recent theoretical developments in plasmonics and its applications in physics, chemistry, materials science, engineering, and medicine. 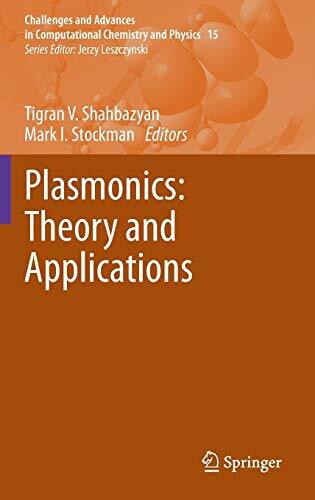 It focuses on recent advances in several major areas of plasmonics including plasmon-enhanced spectroscopies, light scattering, many-body effects, nonlinear optics, and ultrafast dynamics. The theoretical and computational methods used in these investigations include electromagnetic calculations, density functional theory calculations, and nonequilibrium electron dynamics calculations. The book presents a comprehensive overview of these methods as well as their applications to various current problems of interest. Tigran V. Shahbazyan received his PhD from the University of Utah in 1995 and is currently a Professor of Physics at Jackson State University, Jackson, MS, USA. He has served as a Postdoctoral Associate at Ohio University and a Research Professor at Vanderbilt University, and has authored or coauthored over 100 papers in various areas of condensed matter theory including the optical properties of metal nanostructures and hybrid plasmonic systems, optics and transport in low-dimensional semiconductor systems, and ultrafast dynamics in semiconductors and metals. He has given invited talks on plasmonics and other topics at numerous international conferences. Mark I. Stockman received his PhD and DSc degrees from institutes of the Russian Academy of Sciences. He is currently a Professor of Physics at Georgia State University, Atlanta, GA, USA and a Fellow of both the American Physical Society (APS) and the Optical Society of America (OSA). He has served as a Distinguished Visiting Professor at Ecole Normale Supérieure de Cachan (France) and as a Visiting Professor at Ecole Supérieure de Physique and de Chimie Industrielle (Paris, France), and as a Guest Professor at the University of Stuttgart (Germany), Max Plank Institute for Quantum Optics (Garching, Germany), and Ludwig Maximilian University (Munich, Germany). A major direction of his research is theoretical nanoplasmonics, especially theory of ultrafast and nonlinear nanoscale optical phenomena. He is a co-inventor of SPASER (a nanoplasmonic laser). He is the author of over 170 major research papers and has presented numerous plenary, keynote and invited talks at major international conferences. He has taught short courses on nanoplasmonics and related topics at many major international conferences and for scientific institutions in the US, Canada, Europe, Asia and Australia.